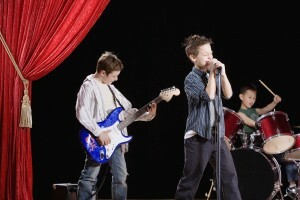 Our Rock Band Program is designed to give students a chance to practice playing together. Playing in a band with other musicians is ultimately what students desire and work towards. There are many recital opportunities throughout the year for all students to show off their work. There are also ensembles of varying levels. Ensembles rehearse on Saturday, students must be enrolled in private lessons to be included in the ensembles. Please Request Info for more. We call it a rock band because everyone understands that phrase, but, we do like to mix in music from many genres. We could call the program rock, country, pop, oldies, we try to do it all! Most of our students learn music they had not known before. We are happy that our program is much more than just rock band rehearsals. They are ensemble rehearsals and group lessons in how to play music together and more. Our students learn song form and the importance of playing their part in the group. Song form means the order in which the different parts of the piece are arranged. Getting it right as a group feels really good. Students love group lessons because playing a part in creating music as a group is extremely rewarding. It also seems to push our students to develop intrinsic motivation skills as they strive to master their part. We believe in learning by doing and rock band rehearsals are much more than lessons. Serving Austin, Leander, Cedar Park, Liberty Hill and Georgetown, Texas.